We’d love your help. Let us know what’s wrong with this preview of Down the Great Unknown by Edward Dolnick. Drawing on rarely examined diaries and journals, Down the Great Unknown is the first book to tell the full, dramatic story of the Powell expedition. On May 24, 1869 a one-armed Civil War veteran, John Wesley Powell and a ragtag band of nine mountain men embarked on the last great quest in the American West. The Grand Canyon, not explored before, was as mysterious as Atlant Drawing on rarely examined diaries and journals, Down the Great Unknown is the first book to tell the full, dramatic story of the Powell expedition. On May 24, 1869 a one-armed Civil War veteran, John Wesley Powell and a ragtag band of nine mountain men embarked on the last great quest in the American West. The Grand Canyon, not explored before, was as mysterious as Atlantis—and as perilous. The ten men set out from Green River Station, Wyoming Territory down the Colorado in four wooden rowboats. Ninety-nine days later, six half-starved wretches came ashore near Callville, Arizona. To ask other readers questions about Down the Great Unknown, please sign up. I loved the author's newest book, The Rush: America's Fevered Quest for Fortune, 1848-1853 so I looked for other's he has written. I enjoy history written from journals and thought the topic of being the first to run the rapids through the Grand Canyon would be an excellent topic. Not to be. The story was all over the place diverting to various places that went beyond supplying the pertinent information for the story to excess detail that need not be part of the book. I did not want a history of I loved the author's newest book, The Rush: America's Fevered Quest for Fortune, 1848-1853 so I looked for other's he has written. I enjoy history written from journals and thought the topic of being the first to run the rapids through the Grand Canyon would be an excellent topic. Not to be. The story was all over the place diverting to various places that went beyond supplying the pertinent information for the story to excess detail that need not be part of the book. I did not want a history of the Civil War for example. “Down the Great Unknown” by Edward Dolnick, published by Harper Collins. 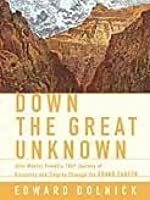 If you are looking for a history book that is full of adventure, “Down the Great Unknown” would be an excellent choice. In 1869 a one armed man, John Wesley Powell, decided to explore the Grand Canyon by way of the Colorado River. He was going to a place no man has been and had no idea of what he was getting himself into. He attempted to get the United States involved in the “Down the Great Unknown” by Edward Dolnick, published by Harper Collins. In 1869 a one armed man, John Wesley Powell, decided to explore the Grand Canyon by way of the Colorado River. He was going to a place no man has been and had no idea of what he was getting himself into. He attempted to get the United States involved in the project but when they refused he took the project on himself. He was able to convince nine mountain men to help him, even though they had no experience on a river like the Colorado. They used boats that were not suitable for the rapids they would encounter. Not only would they have to face the rapids but some were so formidable that they had to portage around them. They were also faced with starvation as the food they brought was either lost or became inedible. When they finally ended their journey only six men had completed the trip, they were exhausted, nearly naked, and in dire need of food. Where do these men come from? What drives them to do the things they do. Where do they find the courage to complete the task when all seems hopeless? A great read that combines history with an incredible journey down the Grand Canyon. I read the book in preparation for an upcoming trip to the Grand Canyon. I read it in my methodical style as I do such books constantly referring to maps and googling other references to increase my understanding. It has me super-excited about the trip! It is a great book about an epic 1000 mile journey down the Green and Colorado Rivers through the Grand Canyon in 1869, led by a man-John Wesley Powell, who had one arm amputated during the Civil War. It is a gripping story with lessons on geology I read the book in preparation for an upcoming trip to the Grand Canyon. I read it in my methodical style as I do such books constantly referring to maps and googling other references to increase my understanding. It has me super-excited about the trip! It is a great book about an epic 1000 mile journey down the Green and Colorado Rivers through the Grand Canyon in 1869, led by a man-John Wesley Powell, who had one arm amputated during the Civil War. It is a gripping story with lessons on geology, geography, scholarly history, theology, and human psychology. The area was unexplored by Europeans at the time and yet the 10 men bravely headed down the river to explore and map the area. They rowed backwards facing upstream, always worried that the next rapid might be a sheer drop-off that would destroy their boats and drown them, and yet they went on with 6 men in the end finishing the trip. The story is based upon 3 men’s diaries with perspectives on each day’s event that are drastically different. I especially enjoyed the excerpts from John Wesley Powell’s diary and book as he is the consummate romantic marveling about all he sees along the way while the others are consumed by their fears. His writing reminds me of John Muir’s. It is one amazing story!!! This is a really well written account of John Wesley Powell's expedition from Green River Station, Wyoming to a Mormon settlement downstream of the Grand Canyon. Edward Dolnick continuously impressed me with his ability to describe all the features of whitewater with analogies and descriptions that made my arm chair feel like an overburdened vessel at the mercy of titanic waves. The story of the ten fool hardy men who risked it all to chart the unknown is told in such detail that at times you wa This is a really well written account of John Wesley Powell's expedition from Green River Station, Wyoming to a Mormon settlement downstream of the Grand Canyon. Edward Dolnick continuously impressed me with his ability to describe all the features of whitewater with analogies and descriptions that made my arm chair feel like an overburdened vessel at the mercy of titanic waves. The story of the ten fool hardy men who risked it all to chart the unknown is told in such detail that at times you want to scramble out of the canyons yourself. Thankfully, the author does just that, he whisks us away to the battle of Shiloh where Powell lost his arm, and later we get out of the canyon to hear 1869's version of fake news about the death's of Powell and his crew. The story of the expedition is put into historical context so that we get the proper setting of this insane excursion. Inevitably, we arrive back in the canyons, painstakingly inching through danger after danger while the food runs out and spirits wane. As a whitewater enthusiast and geologist, I was wary of generic descriptions and inaccurate details. Instead, I found this book to be profoundly accurate and I found myself wondering how I spent so many years paddling white water without making the connections Dolnick put forth to the reader. My only gripe is that he kept referring to the Vishnu Schist as granite, but this is because Powell himself called it granite and the journal entrees of three men where commonly cited. Powell himself wrote eloquently of this adventure, but Dolnick brings an outsider's sensibility to bear on the thing. For example, several of the men kept diaries, so Dolnick can compare their differing descriptions of specific days' goings-on. Also, Powell's published works were written years after the events and he greatly expanded on his diary entries. His memory had to be as fallible as anyone's and his motivation in later life was to persuade congress of his environmentalist beliefs. None of this diminishes the value of his writings, but it allows Dolnick to contextualize the history. Fun to read. I do a lot of hiking and backpacking. My adventures are child’s play in comparison. What these guys went through was astonishing. I picked this book up at the Grand Canyon after watching the IMAX movie that includes a dramatic reenactment of Powell's journey. A one-armed Civil War veteran led the first exploratory trip through the Grand Canyon? And some of the men took a land route right at the end and were never heard from again? Sounds as exciting as the Amazon river & rainforest adventures that I enjoy so much! Parts of this were really interesting, but Dolnick's focus on including every detail written down by the va I picked this book up at the Grand Canyon after watching the IMAX movie that includes a dramatic reenactment of Powell's journey. A one-armed Civil War veteran led the first exploratory trip through the Grand Canyon? And some of the men took a land route right at the end and were never heard from again? Sounds as exciting as the Amazon river & rainforest adventures that I enjoy so much! Parts of this were really interesting, but Dolnick's focus on including every detail written down by the various group members that kept journals made parts really boring, too. I wanted the big picture, the main adventures, not the mundane details. And while some of the additional background (geological history) was interesting, the civil war battle background was not what I came for. That the author was so present in the telling of this story was both its best and worst feature. He brings context to events and circumstances, but he does so through odd illustrations. For instance, he describes a boatman stuck in a muddy whirlpool as being in the center of a massive glass of chocolate milk as it is stirred by a giant 8-year old. It was consistently distracting, but I think it enhanced my understanding of the challenges the expedition team faced in the process of exploring the That the author was so present in the telling of this story was both its best and worst feature. He brings context to events and circumstances, but he does so through odd illustrations. For instance, he describes a boatman stuck in a muddy whirlpool as being in the center of a massive glass of chocolate milk as it is stirred by a giant 8-year old. It was consistently distracting, but I think it enhanced my understanding of the challenges the expedition team faced in the process of exploring the Grand Canyon for the first time. Good book. This is a nicely written account of the the Powell expedition but not a real page turner. I liked the digressions about Powell losing his arm at Shilo. If you want to know about the first trip down the Colorado through the Grand Canyon, this is for you. I think the low draft rubber rafts of today would have made Powells expedition much easier. enjoy. I visited the Grand Canyon last summer and drove through parts of the region discussed in "Down the Great Unknown," such as Glen Canyon. I'm glad that I read this book after visiting because I could use my memories of the landscape to picture some of the scenes on Powell's journey and I could better appreciate the changes to the Colorado River and its canyons that author Edward Dolnick describes. For instance, we stopped to have lunch in Glen Canyon, near the Glen Canyon dam, and I remember thin I visited the Grand Canyon last summer and drove through parts of the region discussed in "Down the Great Unknown," such as Glen Canyon. I'm glad that I read this book after visiting because I could use my memories of the landscape to picture some of the scenes on Powell's journey and I could better appreciate the changes to the Colorado River and its canyons that author Edward Dolnick describes. For instance, we stopped to have lunch in Glen Canyon, near the Glen Canyon dam, and I remember thinking how weird it was that their was this verdant, little metropolis in the middle of the desert. 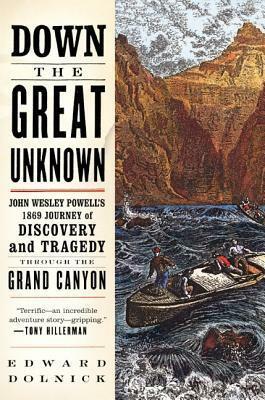 So it was eye-opening and heartbreaking to read about the canyons, rock formations, and Anasazi ruins that Powell floated through and by on his 1869 journey that are now gone, flooded by the Glen Canyon Dam. In fact, in Dolnick's epilogue, he gives a eulogy to the Colorado River of 1869, "The river Powell knew is no more, for it is now interrupted by a series of great dams. In long stretches the river still runs fierce and formidable, but it is a penned beast, like a zoo lion" (p. 289). Even the color of the Colorado is different - it now runs a clear green instead of muddy, tumultuous brown. Dolnick's descriptions of the ways time and humans have transformed the river get to the heart of this book and Powell's purpose for his incredible, perhaps crazy, endeavor. Powell didn't travel down the Green and Colorado Rivers to do something that had never been done before. It was primarily a scientific journey. Powell was a geologist and wanted to study time through the rocks of the Grand Canyon. "Reading those rocks, more than reading the river, was his great ambition...To scan a thousand-foot cliff in the Grand Canyon is to look back a hundred million years" (p. 219). In his chapter, Time's Abyss, Dolnick gives, for me, one of the most understandable explanations of geologic time and the age of the Grand Canyon, as well as Powell's ability to think in geologic time. "The oldest rocks in the Grand Canyon...are nearly two billion years old, not quite half as old as the earth. On a timeline where the history of earth is compressed to a single year, dinosaurs show up only in mid-December and vanish on December 26. (Humans make their appearance on the evening of December 31. Columbus discovers America at three seconds to midnight)" (p. 221-222). Explanations like this helped me understand how the rocks that we see in the Grand Canyon are so very old, but the canyon itself is relatively young, and added a whole new perspective on my memories of the canyon I saw last summer. The chapter Time's Abyss could be considered an aside from the action of Powell and his crew hurtling down the Colorado. Although I appreciated the action of the journey and the depiction of the crew members through the numerous primary sources cited by Dolnick, I think I enjoyed his asides and contextual additions just as much, if not more. Powell and his men were cut off, isolated from all other humans during the trip, so it was helpful for Dolnick to put the audacity of the trip and Powell's goals into historical context: four years after the Civil War (Powell survived the whole river adventure with only one arm); Manifest Destiny; Mormon settlements in the West; dissemination of news; theology vs. geology. Dolnick also uses his asides to contrast what we know of the Colorado today and river rafting today, which I found compelling. That said, it was the action on the river and fate of Powell and his men that kept me turning the pages. "We are now ready to start on our way down the Great Unknown. Our boats...ride high and buoyant, for their loads are lighter than we could desire (they lost most of their food). We have but a month's rations remaining. The flour has been resifted through the mosquito nets; the spoiled bacon has been dried and the worst of it boiled; the few pounds of dried apples have been spread in the sun..the sugar has all melted and gone down the river..but we have a large sack of coffee. We are 3/4 of a mile in the depths of the earth..the great river dashes its angry waves against the walls and the cliffs. We have an unknown distance yet to run; an unknown river yet to explore. What falls there are we know not. The men talk as cheerfully as ever; but to me the cheer is somber and the jests are ghastly." In 4 wooden dory boats Powell and 9 other men were commissioned to explore (what was then a big blank on the US map) the Colorado River (Los Angelas had a population of the time of 5,000 and only a few Mormon settlements existed in the Southwest) The trip was poorly planned from the beginning--the boats were heavy, easy to be tipped, and were rowed facing backwards. The boats were loaded down with excess of geologic and mapping equipment. No experience boatmen were aboard..and nearly all rapids had to be painfully portaged or lined (paying out rope and holding the bucking bronco of a boat slowly through the rapids). Boats were lost, men became demoralized and deserted the trip, food spoiled, leather shoes wore out, and oars were broken...and it all made for a marvelous story. 5 stars. A remarkable story..played out by Dolnick through the diaries of Powell and friends. Powell as mentioned in the book (though not as well known) should be ranked in the likes of Lewis and Clark, Magellan, and Columbus. Remember as well..when Powell began this adventure there was no Glen Canyon Dam or Hoover Dam--so his trip spanned 900 miles of uncharted river. Truly and exceptional story. Read it and you might want to Raft the Great Unknown. Accurate, with any and all speculation kept to a minimum (and clearly stated as such). I highly appreciate that level of literary integrity. The author included brief accounts of other explorers at intervals in the text which were interesting in their own right, but were too lengthy for my taste. The author also wrote sections explaining the level of difficulty the men faced, how others faced similar challenges, and how it compares to today. I found these sections informative and distracting, in Accurate, with any and all speculation kept to a minimum (and clearly stated as such). I highly appreciate that level of literary integrity. The author also wrote sections explaining the level of difficulty the men faced, how others faced similar challenges, and how it compares to today. I found these sections informative and distracting, in turn. The additional background aided the illustration of the difficulty, but I found myself wishing the book were about 100 pages shorter. Overall, a solid book that fills a hole (for me) in American history and does so without dramatic embellishment. Worth reading, at least once. I really enjoyed this book. I read a lot of history, on varied subjects, and love all of it. I recognize though,that often the writing style is a bit "text bookish-ish" and am hesitant to recommend the book to anyone other than someone who is seeking information on the specific topic. This book is different. The writing style is very accessible, and does a great job of pulling you into the story. And what a story. John Wesley Powell, floats the previously unexplored region of the Colorado River,s I really enjoyed this book. I read a lot of history, on varied subjects, and love all of it. I recognize though,that often the writing style is a bit "text bookish-ish" and am hesitant to recommend the book to anyone other than someone who is seeking information on the specific topic. This book is different. The writing style is very accessible, and does a great job of pulling you into the story. And what a story. John Wesley Powell, floats the previously unexplored region of the Colorado River,starting on the Green River in Wyoming and all the way through the Grand Canyon,does so with only one arm, and with a crew of tough but inexperienced men. Oh,and in the wrong type boats. Without sufficient supplies. Before the development of modern river rafting techniques, which equals backwards, literally. Read this book in preparation for hiking trip around Lake Powell and because I love the region. I enjoyed his writing, although I grew weary (along with the men) of portaging and lining rapids for the bazillionth time. I enjoyed the diversions to cultural, geological, political and theological issues of the time. Found it easier to digest than Wallace Stegner’s “Beyond the Hundredth Meridian,” which I did not finish. Interesting look at early explorer's first trip down the Green River and then Colorado River through the Grand Canyon. Interesting to compare his experiences with ours -- what would it have been like to not know what was coming next or how long the trip would be, and doing it in a wooden boat facing backwards?? Also interesting to hear about the interpersonal challenges for a group on such an exploration. I enjoyed this book. Having grown up in Utah I have visited Lake Powell and Lake Mead several times. As a youth I went white water rafting on the Green River. Crossed Glen Canyon and Hoover Dams, visited Flaming Gorge and Glen Canyon. I have visited Lee’s Ferry and even camped on both the North Rim and South Rim of the Grand Canyon, but I never truly thought about the trials of those first adventurous souls who were the first to explore and float down the river until I read this book. Superbly written, fast-moving and so facinating....marred only by a few boring stretches when Dolnick ties to conjure theology (ot rather anti-theology) out of some of Powell's geological journal entries. Powell never makes those connections himself in his journals, so Dolnick's waxing seems unnecessary and agenda-driven in a story already packed full with adventure, history and sociological interest. Those few spots aside, a fantastic read. Although incredibly dry at times, as well as tedious in the level of detail about the most mundane of topics, I thoroughly enjoyed this book. I am amazed at how much Powell and Company were able to complete with so little experience. I have never visited the Grand Canyon, but after reading this I want to take a canoe down the whole thing. There is only so much primary material on which to base this story and the author has done a fine job spinning it into a dramatic tale. It may be a little repetitive at times: after all, how many ways can the perilous passage through one rapids after another be described? But I enjoyed going along for the ride without having to suffer the awful perils of the trip. Great story of the first documented trip down the Colorado. Dolnick tells the story well and captures some of the excitement and terror the men must have felt as they descended into the deep canyons with no way out but to run, portage or somehow get through the rapids they found. Great report of Powell's trip down the Green and Colorado Rivers in 1869. They should not have been successful for many reasons but they succeeded. Book included complimentary information and photos. Interessant boek over een Amerikaanse held waar ik nog nooit van gehoord had. Geen hagiografie. Gelezen terwijl ik op reis was in de regio waar het zich afspeelt. Alleen het aantal passages over alle ins & outs van het huidige wildwatervaren had wat minder gemogen. I bought this book in a gift shop at the end of a 4 day rafting trip through the Grand Canyon. It's an interesting mix of history, geology, and adventure. What courage those men had! A fascinating read. Very good and satisfying. Well written. Hard to put down. This book was what I hoped it would be. Meticulously researched and arranged, written in an engaging style. Definitely a good, and informative, read. Outstanding book, communicating the amazing accomplishment of the Powell Expedition. Dolnick paints the picture well, with smart tangents that provide context.